PHILADELPHIA, PA> Sharon Lia, the musical and lyrical powerhouse from The Sharon Lia Band has, again, out done herself with the formation and organization of the "Ladies Who Rock 4 A Cause Music Festival". As stated in the organizations press release, "Ladies Who Rock 4 A Cause, is a Bucks County Based 501©3 charity that was established in 2016. The organization is driven by the mission “To use the unifying power of music to help those in need.” The foundation, its volunteers, the collective group of musicians and their support network work to bring donations, educational programs, and more to their immediate and surrounding communities. They seek and are working to be the change they wish to see in the world." This inaugural festival will be held on June 9, 2018 at Cannstatter's , located at 9130 Academy Rd. Philadelphia PA 19114 from 12pm to 11pm. This festival will include wonderful music acts as well as over thirty vendors supporting the cause. Pre-sale tickets are available for $18 online at the organizations website. Tickets will be $20 at the door on the day of the show. 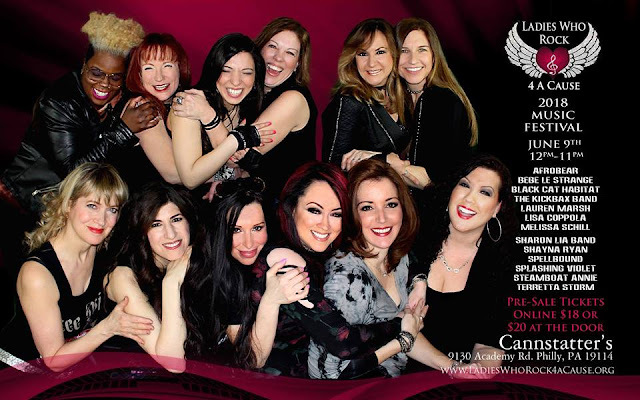 For more information about the festival or the foundation, visit www.ladieswhorock4acause.org, email info@ladieswhorock4acause.org or call 609-954-5523. The announced lineup and performance times are available below.